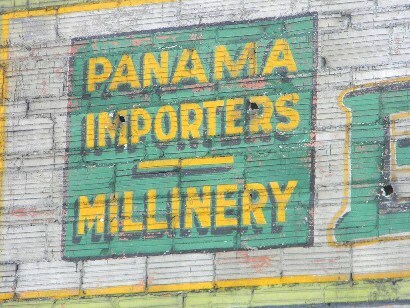 Ghost Sign Appears in Downtown St. Petersburg. The Brothers Ermatinger point to their grandfather's name. 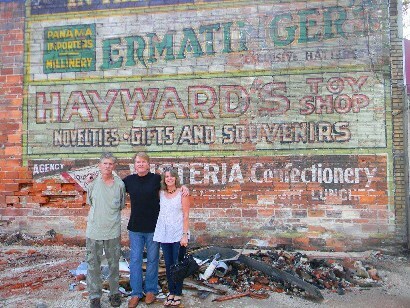 The discovery of a �new� ghost sign is to a signage appreciator what the discovery of a vintage car hidden in a barn is to a collector. Numbed by the onslaught of signage one is subjected to every day, it�s a wonder this one was noticed at all, let alone, being featured �above the fold� of the local newspaper (albeit the local section). Painted on the side wall of what is currently the Central Coffee Shoppe, this sign dates to the late 20s or early thirties. It was an era when a woman might receive a box of �Wisteria Candies� from a natty suitor in a Panama hat. Just cattycorner from St. Petersburg�s 1929 Kress building (in great shape, by the way), the sign had been hidden behind a neighboring building � that has just been demolished. Tom, John and Lois Ermatinger found out about the sign when their phones started �ringing off the hook� (a fittingly antiquated phrase). Observant friends and clients (Lois is a realtor) recognized the brother�s surname on the sign's photo in the paper. Could they be related? They could. They are. Although the brothers (native St. Petersburghers) were well aware that their grandfather had been in the clothing business at a nearby downtown address, they were unaware he had once been at this address. It was like discovering a new photo in the family album. Our personal visit to the sign was delayed for various reasons and it wasn�t until dusk when we finally got there. Serendipitously, we found the brothers (and John�s wife Lois) in the act of recording the appearance digitally. 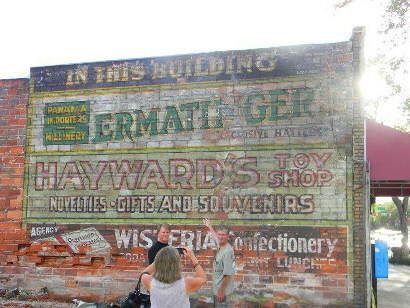 If it wasn�t for the brothers pointing to the sign, they may have gone unrecognized as just enthusiastic ghost sign aficionados. 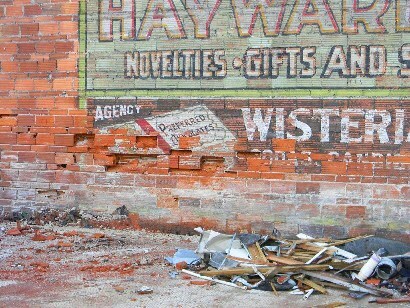 Yes, there really are book on Ghost Signs. Our thanks to Tom, John and Lois for sharing their story. It was our first experience in meeting native-born St. Petersburgers (if that�s the official designation) and from their candor and friendliness � we feel St. Petersburg should do all that it can to produce more natives. 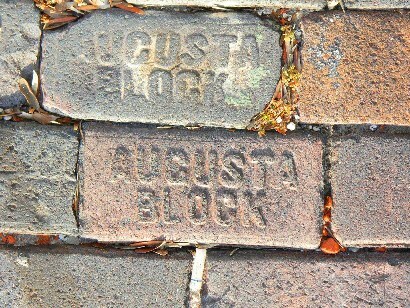 Paving bricks in the rear alley reveal another untold historic story.